Fire in Babylon is a ridiculously entertaining new documentary which charts the ascension of the West Indian cricket team from likeable losers (“calypso cricketers”) in the early 1970s to the all-conquering centurions that dominated Test cricket for 15 ominous years with a deadly combination of powerful batting and searing fast bowling. 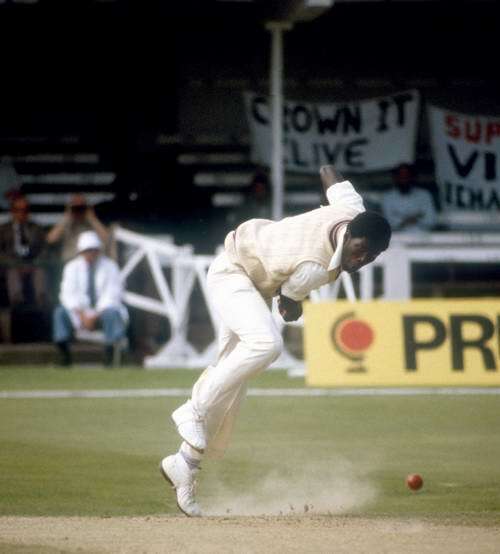 Director Stevan Riley cooks up an appetizing brew of tension, suspense and brilliant archive footage augmented by revealing, candid testimony from the era’s key players including Michael Holding, Clive Lloyd, Sir Viv Richards, and the unforgettably deadpan Andy Roberts. Absolutely crucial to the film’s success is its sound. The sound designers have a field day as every thwack on a helmet, blow to the torso of a hapless batsman or skittling of stumps (often, wonderfully, belonging to a pasty Englishman, bringing whoops of delight from the LFF crowd’s Caribbean contingent) is galvanized by a meaty thud on the soundtrack so intense that it caused me to wince in my seat on a number of occasions. Riley and his editor have pulled off a major coup by imbuing a sport often mistakenly thought of as sedate and genteel with the visceral thrill evocative of the gladiatorial arena or boxing ring. As an audience member, you really feel how fast these bowlers were; how dangerous they were on top of their game. In addition to this, the film boasts a barnstorming reggae soundtrack featuring the likes of Bob Marley, Burning Spear and a host of captivating performances from locals. Like any good sports film, Fire in Babylon is about much more than just the sport itself, and it certainly doesn’t shy away from the complex issues of identity, racism and the financial intricacies and pitfalls of professional sport. Informative about the pan-African unity which the team’s monumental success inspired and the post-colonial complexities inherent in the West Indies’ relationship with former “masters” England, Fire… also functions as a crucial history lesson. 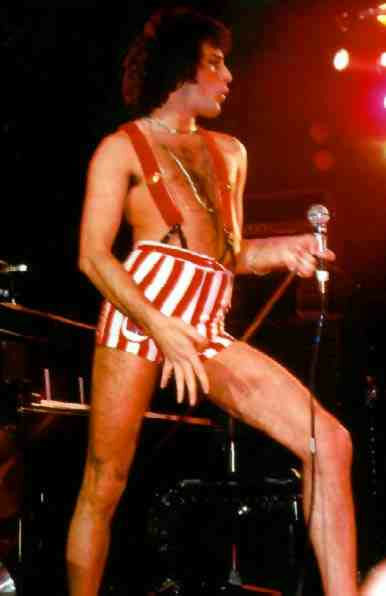 Freddie Mercury. Colin Croft just out of shot. While primarily charting the progress of the West Indian team as a collective, Riley skillfully weaves participants’ individual stories into the narrative. Hence, there is graduation of the thoughtful, older captain Clive Lloyd into a pragmatic leader of steel, the maturation of a callow Michael Holding into the nerveless quick monikered ‘Whispering Death’, and the quintessential man’s man, Sir Vivian Richards, visibly moved when recollecting his endorsement by the great Nelson Mandela. Then there is the sad story of fast bowler Colin Croft, who predated Freddie Mercury by breaking ranks and embarking on an ill-advised renegade trip to Apartheid-era South Africa. His defiance and dogged explanation (“I needed the money”) can’t hide the sadness in his eyes and the pain of being ostracized. The Aussies also get in on the act; in one hilarious piece of archive footage, we get a glimpse into Aussie fast-bowler Jeff Thompson’s ‘day job’, which appears to literally involve him jumping off a speeding truck in the desert to wrestle wild animals! Fire in Babylon is an electrifying, frequently hilarious, instructive and ultimately moving experience, and will hopefully be picked up by a distributor before long. It is sure to be a massive hit, especially with an opportune summer release, and (and now we’re really in the realm of the hypothetical) an overdue resurgence by the current West Indian team! Fire in Babylon next screens at the 54th BFI London Film Festival on Thu 21 October. This entry was posted in Reviews and tagged bouncers, cricket, Fire in Babylon, Justin Bieber, LFF on October 19, 2010 by Ashley Clark. Looks lik a cracker of a movie..